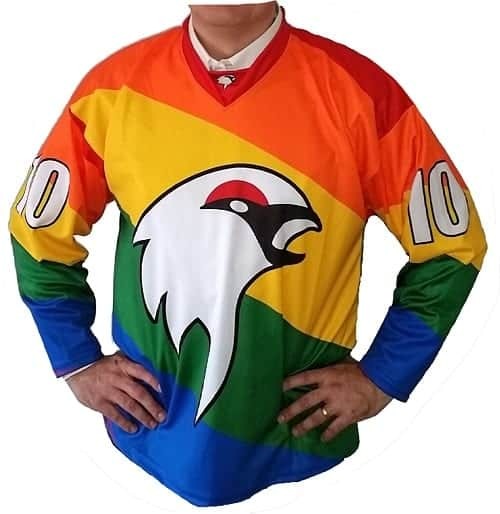 Swedish ice hockey team Kiruna IF will wear rainbow colors for the 2014-2015 season in an effort to become the country’s first sports club to receive certification by the Swedish Federation for Lesbian, Gay, Bisexual and Transgender Rights. Since 2008, the federation has certified businesses and organizations that are committed to providing a good working environment and respectful treatment of LGBTI people, reports Gay Star News. On Thursday, 26 June, the players presented their new jerseys and talked about how the club will work to promote acceptance and diversity in Swedish hockey and in society at large. "The certification program provides new skills and tools and helps promote LGBT visibility. The focus is on LGBT issues but the certification process is also an excellent opportunity to discuss and reflect on norms and attitudes in a broader perspective." Throughout the coming season, team members will give talks in schools across Kiruna to stress the importance of accepting LGBTI people.